Who knew your favorite childhood craft could be so pretty? Last Christmas I spent the week with my extended family in a little ski house in the mountains in Colorado. My cousins brought along some activities for us to do together, including shrinky dinks! 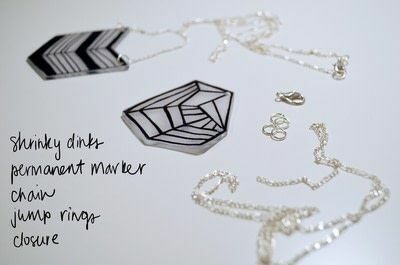 Shrinky dinks bring back so many fun childhood memories, so I was pretty excited to try them out again...I wanted to make something that I would actually use, so I looked at some of the jewelry that I've been eyeing for inspiration. I realized that I could easily make some geometric style necklaces. You could also make earrings or a bracelet or maybe even a ring. It would also be fun to add in more colors. So many possibilities! Draw your design onto the shrinky dink paper and cut it out. Remember to make the design about twice as big as you want it to be when it's done. Use a hole punch to make holes in your pieces (make sure they aren't too close to the edges). Now, follow the backing instructions on the shrinky dink package. 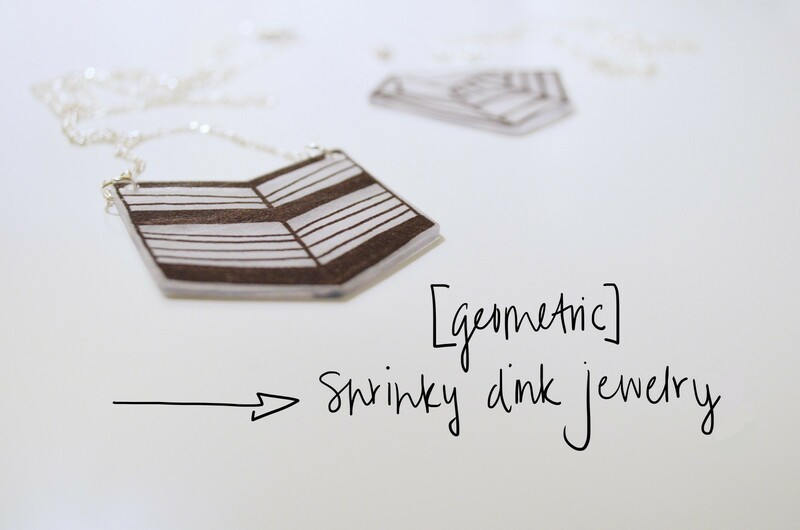 You may find that your shrinky dinks try to curl up - make sure you leave them in the oven long enough because they will eventually return to being flat on their own. You should also keep an eye on them and carefully flatten them with a spatula if it looks like they are going to curl onto themselves completely and get stuck. It can also be helpful to heat up the pans before putting the shrinky dinks on. When your shrinky dink is done baking, attach your chain to the piece with jump rings, and you're done!